The question I asked myself lately, it ain’t as much where I want to go, where I want to eat, or what new toys I want to get. Rather, I am asking myself am I investing for the Kingdom? I know it sounds so weird. Yes, Kingdom of God is important. But really? What does it mean? In the whole grand scheme of things, if I am going follow Jesus and be His disciples, how important it is to do His Work in sharing the Good News, in helping the poor and in taeching others His ways? The answer is easy, VERY IMPORTANT. Last Sunday, the pastor preached on the First Ressurecction (Revlation 21). He warned us that we better be sure we are going to make it to heaven because eternity is a long time to regret. I remembered what Jesus said in Matthew 25 using the parable of the Ten Virgins. There were ten virgins waiting to meet the bridegroom at night. Each of them has a lamp. Five of them were wise and took oil for their lamps. The other five were foolish and didn’t bring any oil. As the foolish virgins went out to buy oil, the bridegroom came and the foolish virgins missed the wedding banquet. At the end of the Parable, Jesus reminded His disciples to keep watch. We are called to keep watch. I will admit that anticipating for Jesus to come back is not always on top of my priority. Yesterday, I told my friend that we probably don’t think Jesus will come back any time soon. Afterall, it is already 2000 plus years since His Ressurecction and Ascendsion to heaven. Really? He will come back anytime now? If we sit down and see the things we worry and the things we focus on on our list, I can easily say that most of them are for this life time. Maybe retirement (that’s about 30 years from now). Maybe getting a car (that’s within a year or two if you are working). Maybe finishing University (3-4 years). Or getting married (a few years depending on the stage of your relationship). You might think surely these are practical things we need to be mindful on. Of course, they are. What I seeing is that these shouldn’t always be top priority of our lives. Yes, they are important but they are secondary importance. When we see what happened afterwards in the Book of Acts, we see that there’s a great urgency to preach the Gospel until the end of the earth. The disciples were focus and filled with passion. They had urgency. On the first day of 2014, Wai Jia and I prayed together. We gave thanks for how the Lord worked in our lives in the last year. I prayed for us to be bold and courageous as we are stepping into 2014. There will be many changes and transitions. There will be many challenges as well. At the same time, there are many opportunities for us to prepare and to do His Work :). Time is short. Let’s make the best of it. A while ago during fellowship, someone said, “well Jesus said we will always have the poor.” I wasn’t sure what we were talking about. Maybe it was about the poor. Then we talked about something else. For the longest time, I felt there’s something not right when it comes to using this line. What does it really mean when we say that we will always have the poor? More importantly, what does Jesus means when He said that? What is He implying? Side note, this is also mentioned in John 12:7. Jesus was in Simon the Leper’s house (verse 3). A leper in Jesus’ days is considered a social outcast. This means that financially he is not well off (aka he is poor). Notice what it says in the rest of verse 7 (The poor you will always have with you, and you can help them any time you want. But you will not always have me). Jesus is implying that the disciples should help the poor whenever they want. This means that as disciples of Jesus, it is regular practice for them to help the poor. My eyes nearly popped when I read this. The whole chapter 11 focuses on erasing debt, compassion and generousity when it comes to helping the poor. When we say there will always be poor people, what are we implying? More importantly, how should we respond? We see that the poor is always with us. The problem is too big for us to do anything about it. Therefore we do nothing. We continue to live our lives and let other people and maybe the government to do something about it. We response with generousity and in compassion. We help those who are poor and needy. From my own experience whenever this line is use, we tend to do the first option. Yes, there are many people who are in need. But didn’t Jesus say the poor is with us? Let’s move on to something else. This line should encourage us to help each other to be more generous and compassion. Both Wai Jia and I are learning how this looks like in our lives. Recently among our busy schedule, a friend, Dennis, contacted us that he needed help. We went and visited him a few weeks ago. Due to his financial situations, he had to move into a one room flat (that is one room living space and a washroom) with a stranger. As we visited his place, he told us that he needed a washing machine and a bedframe. After talking among ourselves, we decided to help Dennis. 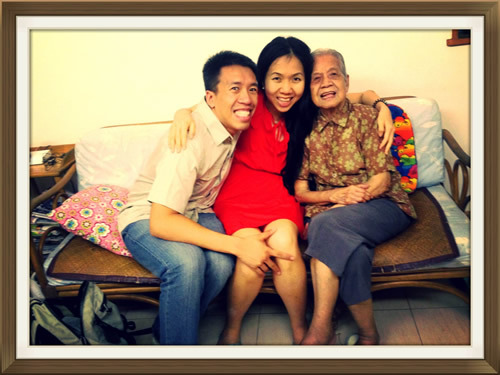 Wai Jia asked for help on her blog and we were able to raise the funds to get what he needed. The bedframe and the washing machine was delivered to his place last Friday. He couldn’t be happier. It was an early Christmas present for him. Sometimes when these circumstances come my way, I know that it is very easy to have excuse. I am too busy. I am too tired. I have other things I need to do for God. I have my own responsibility. …because the poor we will always have with us. I lived in Hong Kong until I was eight before my family moved to Canada. Hong Kong has a special place in my heart. I have fond memories of my relatives and cousins gathering together during Chinese New Year and other holidays. For Christmas, I would stay at my grandparents (my mother’s side). They would put up a Christmas tree filled with ornaments. One type of those ornaments was a small present tied together with a bow. Even though the inside was nothing more than a styprofoam cube, I would unwrap one of them each visit. Earlier this year, New York Times published an article describing those who know their family background fare better in life. By understanding our heritage, we become more resilient in lives’ uncertainties. I am beginning to realize there’s certain truth in that as I reflect my family heritage. With Wai Jia and I looking to serve overseas next year and then going back to Canada to renew my Health Care, we figure we won’t be able to visit Hong Kong for a few years. With this in mind, last weekend we went back for a short visit. Being in Singapore for the past two years, I had the privilege of going back to Hong Kong more often than when I lived in Canada. Each time when I go back, I gained gain another piece of my heritage. 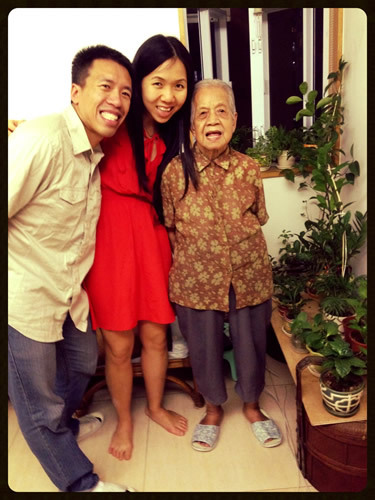 My visit in Hong Kong always include seeing my 90 year-old Grandma. She’s a fragile old lady with immense joy, peace and full of faith. Since most of my relatives are not believers, it was a special moment for me to spend time with the same faith and raised me when I was young. She had a simple faith. There’s no deep doctrine discussion. Nothing about Calvinist vs Arminian. Nor Reform vs Charismatic. Nothing about mission methods. Simple and yet, deep faith. Her church gave her Chinese poetry. Each line contains only three characters. But these three little characters will contain a piece of divine truth. Every morning she will go for a walk in the park. As she stroll, she will recite the poem. It will take her thirty minutes to recite the whole poem. Despite her age, her mind is very active. She knows that 30 minute = 5,000 steps. Since her walk takes one hour, her walk to the park will take 10,000 steps. Afterwards she goes back home and exercise some more. While exercisinng she will recite Scriptures as well! Wow, what an active phsyical life and spiritual life! It was such a joy and frill to hear her daily prayer for us. It is seeing my grandma to have such a deep hunger for prayer that re-ignite my own prayer life. It is also an encouragement for me out here in Singapore to have a family interceding on my behalf. With all the things we worried when going on the field, medication, financial support, enough clothes for our back, at the end or at the beginning in following Christ is prayer and faith. All the other things are secondary, we need to stay close to God. He will guide us and open the door for us. I don’t know if I will see her again. I wish I will (at least on earth). I often wished I have more time to hold on to to spend time with my family, my relatives and my love ones. But given the short two years in Hong Kong, we do the best that we can. With lots of hugs and farewell, we left the little unit and said good bye to my grandma and my aunt. For the past few weeks, many people inquired about the future of my wive and me. My role with OMF is for two years. I decided to renew for six more months to finish up some of the projects that I am involve in. I can say, the next few weeks and months will be very busy as I am helping to revamp and upgrade a key part of their IT system. As much as it is great for people to pray for us, it is also a trying period in our lives. Many people, with good intention, ask about our future. And to our best intention, we do not have any answers. Where are you going to go after OMF? What about staying in Singapore? Have you thought about that? Yes, but we are letting the Lord to guide us. What about your work visa? What happens if it expires? I do not know. I can ask for an extension. But really we don’t think we will stay here for long. What about going to Canada? Have you consider that? Yes, we have. Shared about our tales in Canada….then decided to go on mission. What will you do if you are going on mission for a year or two? Has God revealed to you where you will be going? As you can see, it is not much of a conversation. In a way, it sounds rather negative. Just no no no no and more no. To be honest, I do not know and Wai Jia does not know. This is not due to the fact that we are naive and unprepare. Though our answers seem to point to us that we never consider our responsibility and practicality. It does sound like we are irresponsible. We have to think about our future. Where will we take care of our family? What about savings? What about my own health? What about Wai Jia’s career? The truth of the matter is that we both discuss, think and pray through many of these scenarios. Today, I had a little revelation of our current situation. It is an image of a small boat bobbing up and down among a temptest in a vast ocean. Imagine if you will you are sitting on this wooden little boat. We are in a scenario in which we have little to control. There are scenarios and there are possibilities. There are dangers and risks. The storm of the seas pushes this boat up and down. The raining is pouring and lightning is all around you. The boat is so fragile and so small. At any moment one wave will push the boat over. I immediately thought of the story of Jesus calming the sea. Just like how my image of a boat among the storm, the disciples were in the same predicament. Jesus was sound asleep. In their fear, they cried out to Jesus to calm the storm. Jesus rebuked the storm and told the disciples they had little faith. The disciples were stunned. Who is He with the authority and power to stop a storm? And so I found myself in the same scenario. Jesus is in the boat. So am I. He is also sound asleep. Am I afraid? Definitely! At the same time I know if Jesus is with me, things will be alright. So among the storms and the unknown, I am resting in Him. He is taking us deeper than both of us experience. I know I need to go deeper. I need to build up my faith. We need to press in. He is taking us deeper than both of us experience. We are on journey rock back and forth by the waves of uncertainty, doubt and risk. In the stormiest of our lives, we rest on His Grace and His Faith. Ever since I got married, one of the things I tried to save time is to iron all my shirts at once. Since it is a mindless activity, I will go to Youtube and listen to a sermon or two. Lately, I’ve been listening to Ravi Zacharias. Ravi was preaching the temptation of Christ in Matthew 4. The second temptation was when satan took Jesus to the top of the temple and asked him to jump down. Ravi used this temptation as an example of how we often use God. He joked that as long as school have math exams, there will always be a reason for prayers! How often do we, do I, reduce God to merely a genie in the bottle. I called on Him ONLY when I need help. If we reduce to calling God merely for our needs and wants, then we are god and He is just a tool in our pocket. I still remembered when I first got into triathlon in 2005. I told God I will train hard and win first prize to bring Him glory. The truth is, as I look back, I was merely chasing my own glory. Of course, in front of others, especially Christians, it sounded great. I am doing something for the Lord. Amen! But thanks be to God for He never made me fast. I never made to the podium. Not by a long shot! God didn’t gave me a, ‘ha, see how sinful you are.‘ I was sinful but He was very graceful in showing how far I fall short. Slowly, He humbled me and conformed me for His purpose. In 2009, I competed for the last time. It was the World Transplant Games in Australia. I was competing for 5 km bike time trial and 5 km running race. Before the race, my prayer was no longer winning. It was to glorify Him regardless of winning or losing. If winning equate to not giving Him glory, I do not want. The saddest part is that in church I see individuals who are gung ho for Jesus and want to do something for Him. But deep down, their desire is to lift themselves and their own pride. This is what sin is. It is not merely a list of wrong things we do. It is the intention to say we are in control and we do not need God. It is the rebellious selfish spirit with lustful eyes to fulfill our salviting plans. As a Christian, for those who say they follow Jesus, we must examine our own lives and motives. Why am I so bent on wanting to get ______ (insert the thing you want)? Have we ever stop and ponder why this one thing is so important in our lives? Is this one thing become our identity? Is our lives incomplete without it? How do we know unless we kneel before the Lord and let His Spirit convicts us? May we live our lives seeking His Glory and not flaunting our own. 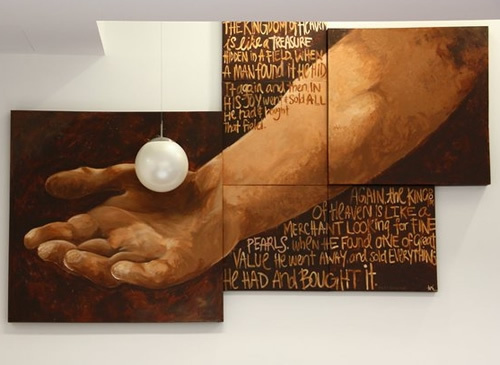 Before coming to Singapore, I spent a lot of time dwelling on the cost of following Jesus. When Jesus shared this parable, and the one before this (the parable of the hidden treasure), did He really mean what He said? I understood precisely what it meant. Following Jesus has a high cost. His Kingdom has a high cost because Jesus had to die on the cross for it. It will cost us personally and dearly because the one we followed paid the price with His life. It will cost us everything. The value of His Kingdom is worth more than everything we have. Since coming to Singapore, Starcraft 2 is what I do for fun. It is a computer game I played since I was in High school. Three weeks ago, during one of the weekly talks with my wife, she sensed we ain’t seeking as hard as we should. We talked where we were spending our time. Well, Starcraft 2 was on the discussion. Without hesitation, I told her I would fast Starcraft 2 for two weeks. To my wife credit, she also fasted from something she consider important to her as well. For some of you, you might think this is a childish thing for a 30 something to spend his time playing a video game. In Singapore, I do not have many things I do on my downtime for fun. We don’t have a tv at home (which I don’t mind because I don’t watch tv). I don’t follow sports. I have very little leisure activity. During this fast, once in a while I would want to justify in playing. Everyone deserves down time right? This is not a bad thing. I need a break once in a while. I remembered Wai Jia telling me a story of one of the missionaries. The missionary wanted to collect fishes as a hobby but the Holy Spirit forbid her to do so. When she went to the Lord to protest and stating that her friend (another missionary) had six hobbies, the Lord replied: “Even with her six hobbies, she still put me first. If you have the fish, you will not put me first.” Ouch. Sometimes the conviction of the Holy Spirit is sharp and deep. I am now almost a month Starcraft free. It is so much to justify I need to play or I need to _______ [Insert your fun things to do: shopping, eating out, movie, tv shows/dramas, video games etc.] than to dedicate ourselves to the Lord. I remembered what’s at stake here: a little video game or the Kingdom. Last night, I led a little Bible study with Wai Jia. She’s currently my only student (and my guinea pig hehe). We were studying the Parables of the Sower. In particular, we were discussing about the seed in good soil that grew thirty, sixty and a hundred-fold. Looking at Wikipedia about this parable, some commentaries said that the difference between thirty and hundred fold is dependent on the response of the seed. In order words, those of us who are the good seed can determine how much fold we want to produce. If you want to serve God, do you really want a thirty fold? Or a hundred fold? Of course, a hundred! We both agreed we wanted a hundred fold. So what’s the difference between the thirty fold and those of the hundred fold? Well, it means we have to prepare ourselves even more. We have to dig deep. We have to focus. Before fasting from Starcraft, I always complain to Wai Jia I never have enough time. Never have time to pray. Never have time to read the Bible. Now that I am fasting, I have a lot more time on my hand. I realized that giving up some fun time is what’s needed in order to grow and groom myself spiritually. The reality is that we only have 24 hours a day. If we want to do something, we have to sacrifice something else. With this in mind, if we are to invest in the Kingdom totally, we will have to sacrifice even more. There’s no easy way.